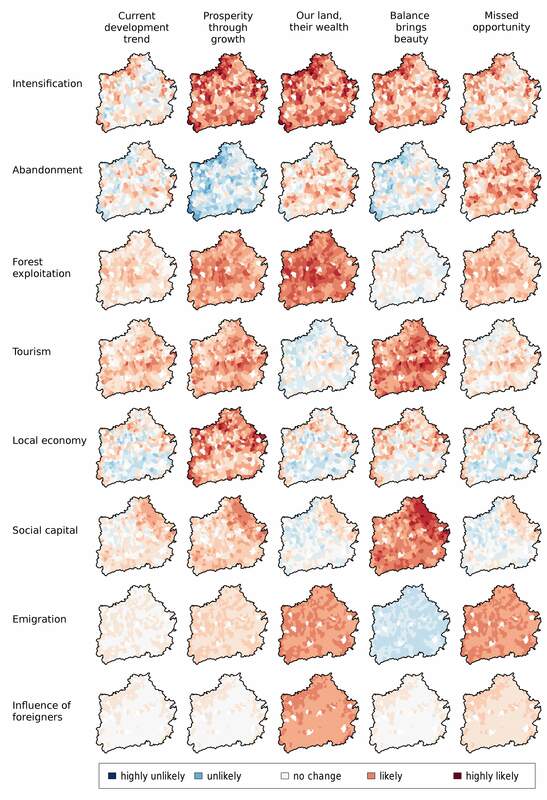 Yesterday, Ecology and Society published our paper on a assessment of current and future development trends in Southern Transylvania (full paper can be found here). The paper is meant to give you a flavour of the threats and opportunities faced by this beautiful but also troubled part of Europe. Besides that, I think it nicely reflects the inter- and transdisciplinary nature of our project, and we as a team have put quite some effort into all the bits and pieces that went into that paper over the last two years. In this study, we apply a holistic approach (see Fig. 1 for a methodological overview) that considers multiple scales, spatial heterogeneity and uncertainties in order to get a better understanding of the dynamics of this particular social-ecological system. The approach starts with characterising the local social-ecological conditions throughout the study area, using villages as the units of analysis. 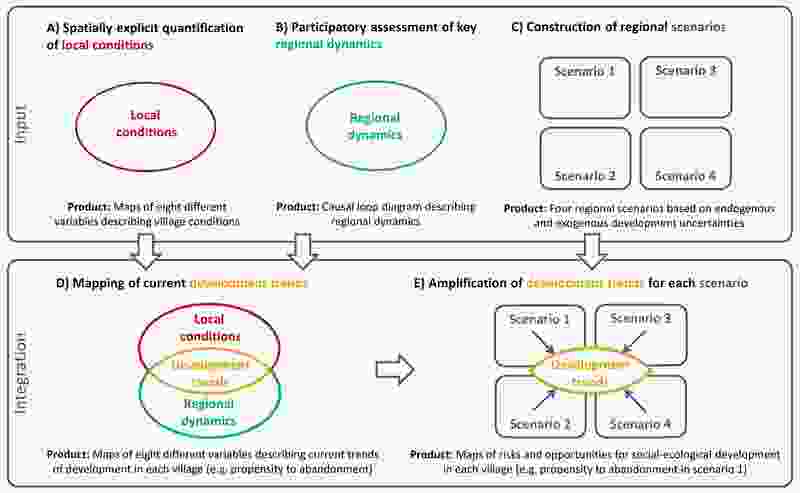 We combined this local understanding with a description of the regional system dynamics, and we developed a spatially explicit understanding of current development trends for eight different variables (e.g. 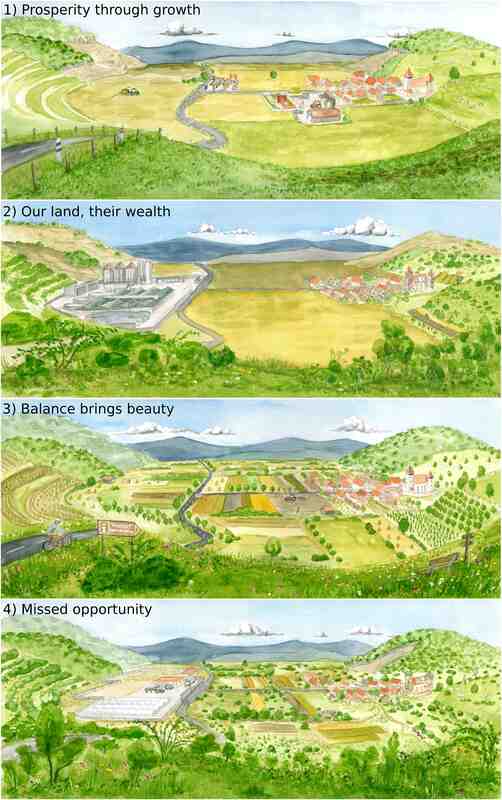 land use intensification, forest exploitation, emigration). Then, together with local stakeholders, we developed future scenarios for the region through a series of scenario planning workshops. The resulting four scenarios reflect the influence of the most important (and most uncertain) drivers for the future of Southern Transylvania, namely international and national policy settings and the ability of locals to capitalize on opportunities. Readers of this blog might know the scenarios and the pictures (which I painted, see Fig. 2) already from other publications. Based on the scenarios, we then assessed how the current development trends might change under different scenario conditions visualizing both regional trends and internal heterogeneity in development (see Fig. 3). Overall, our results highlight that current conditions and trends are strongly influenced by legacies, i.e. past conditions and changes in the system. Further, they show the importance of external drivers (EU and national policy settings) for future developments and finally, how the influence of these external drivers can be amplified or counteracted by internal factors (education, leadership and bridging organizations). The paper will be part of a special issue in Ecology and Society with the title “Programme on Ecosystem Change and Society (PECS): knowledge for sustainable stewardship of social-ecological systems”, which is going to come out some time next year, I think. Hanspach, J., Hartel, T., Milcu, A., Mikulcak, F., Dorresteijn, I., Loos, J., von Wehrden, H., Kuemmerle, T., Abson, D. J., Kovács-Hostyánszki, A., Báldi, A. & Fischer, J. (2014) A holistic approach to studying social-ecological systems and its application to Southern Transylvania. Ecology and Society 19(4): 32.